In modern times, this term has been used to refer to someone who adopts a negative attitude to something because they cannot have it themselves. In truth, I’m not sure how many people today really invest in the sour grape doctrine one bit. There are so many confusing aspects to being “stuff happy.” Where I live in the San Francisco Bay area there are garage sales and thrift shops galore, and folks often put nice items on the streets with a “free” sign on them as well as posting them on the local Nextdoor social network. But, it costs a small fortune to buy a home here, and rents are sky high so it’s a real conundrum as to where all the “stuff” can go. And of course, homelessness is at an all-time high across most of the country, so that limits acquisition of material goods at a heartbreaking level. The world of wine can have a lot of snobbery attached to it, with some aficionados believing cost represents quality, but if you do a little research you will find much evidence to the contrary. We living here in “wine country” can buy delectable wines made from top notch local (and anything but sour) grapes at the Grocery Outlet for a fraction of the retail price, or join scores of discounted wine clubs. I know that one-percenters like to shove their high wealth inequality around but I suggest those elitists are not near as happy as the rest of us because they don’t get to adapt and discover how to enjoy life one affordable moment at a time. 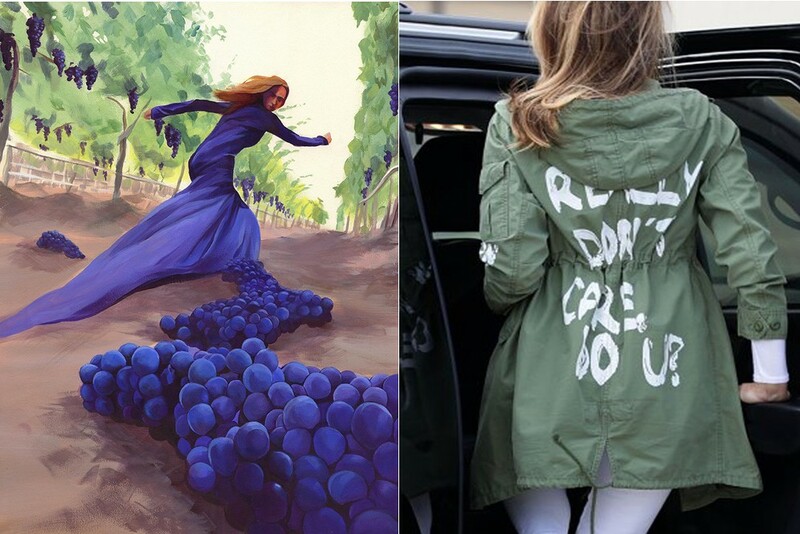 Take Melania Trump’s infamous jacket that she wore when she went to Andrews Air Force base to learn first-hand the situation to which her husband’s immigration policy was separating young children from their parents at our border. In order to feel like “one of the people” she donned a $39 bargain from Zara rather than from one of her normal exorbitantly pricey designers. But in the process, she insulted everyone, including her clueless self — and she could not pull it off. No way. I think “sour grapes” is a doctrine in need of an update — a beautiful visage of simple contentment and thankfulness.